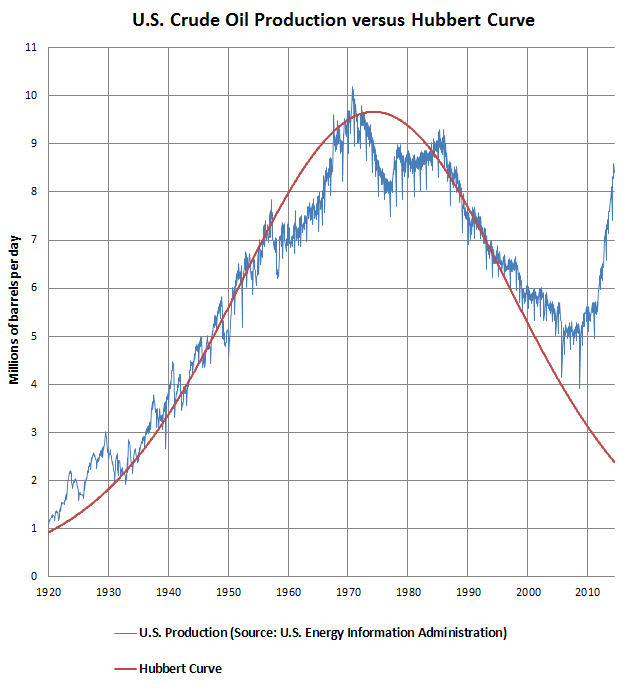 US Crude Oil Production 1900 to 2010 matched against a typical Hubbert Curve (Hubbert was a geologist who correctly predicted in 1956 that US oil production would peak in the 1970’s). Data from the US Energy Information Administration. From Creative Commons, Wikipedia. A recent Business Week article looked at the politics affecting the construction of the XL pipeline. If you’re joining late, this is the proposed pipeline that will carry Canadian oil from tar sands across the US to the Gulf of Mexico, ostensibly for refinement at refineries in Texas and Louisiana. Proponents tout cheaper gasoline and pipeline jobs; opponents counter that the refined final product is destined for China, not the US, and the total number of permanent jobs provided by the pipeline will be nominal (under 100 personnel to monitor the pipeline). By the way, it should be noted that the oil will end up at those refineries regardless of the pipeline–it’s currently being brought down by rail, but a pipeline would be orders of magnitude less expensive. The article points out (correctly) that oil interests have had their way politically in the US since the 1920’s, when cheap American oil drove the steel and auto industries. “For nearly a century now, broad swaths of the populace and powerful individuals in government, finance, and other key sectors have seen oil as indivisible from national interest. That presumption has arguably deepened with the current shale oil and gas boom that the International Energy Agency forecasts will turn the U.S. into the world’s biggest oil producer by 2015″. But the Business Week article, like many others in recent vintage, drives several bizarre and easily disprovable bromides. The worst is that the US is a top oil EXPORTING country. The Business Week article states (based on an International Energy Agency report from the UN) that the US is producing some 13 million barrels of oil a day–but the U.S. Energy Information Administration (EIA) is considerably less enthusiastic for the prospects of US energy growth than the IEA, and has a better track record. The EIA has predicted that oil production will peak at around 9.5 million barrels a day. And the US is still a major IMPORTER of oil. The ‘export’ capacity may be due to processing of other countries’ oil products at our refineries (i.e., Re-exporting). That’s a value added product, but we aren’t exporting OUR oil. That is against the law and has been since 1975. In fact, according to the EIA, the US used 18.83 million barrels of Oil PER DAY in 2011, which was actually DOWN from the previous year’s 19 million barrels (stats HERE). By contrast, the US was using upwards of 20 million barrels per day in 2005, when oil prices went to the then- unprecedented high of $50 a barrel. High prices reduce use; so do recessions/Depressions. During the Great Depression, oil usage fell so low the companies were practically giving it away (‘dime a barrel’ deals were not uncommon). By contrast, the Great Recession that began in 2008 may well have been driven by exploding oil prices, which topped $147 a barrel that year before prices (briefly) crashed along with the housing bubble. Oil prices have been hovering around the $100 a barrel range ever since, rising every time there was increased demand (and thus stifling economic recovery). Per the late Matt Simmons (head of one of the largest energy investment banks in the US and author of TWILIGHT IN THE DESERT, a book about Saudi Arabia’s oil peak), you cannot grow economies without growing energy use. Thus in some ways, the US was in far better shape energy-wise in 1934 than it is now. My point: If the US is producing 9.5 million barrels a day and using 18.83 million, we are NOT an oil exporter, and we WILL NOT become energy independent as long as our primary energy source is fossil fuels. That little uptick on the EIA chart above is due to ‘unconventional’ fossil fuels–what is derived from oil shale, fracking, ‘tight oil’ and tar sands. Unconventional oil and gas are expensive (requiring significantly more capital cost) and deplete very rapidly. And remember, Peak Oil theory doesn’t say we will run out of oil. It says we will run out of the oil, coal, and natural gas that is cheap to extract. It doesn’t really matter if the Bakken range has 500 billion barrels of oil in it (it doesn’t, btw). If the oil costs more to extract than it can be sold for, it will be left in the ground. When oil was bursting out of the ground in places like 1930’s Texas, the investment of a single barrel of oil could bring you 100+ barrels. Undersea extraction (which is what we’re doing now that the wells in Texas are drying up) has a return of about 11 to one. There will come a point when the energy return won’t exceed the investment, at which point the fuel will be left in the ground. The Takeaway–we are not an oil exporting country and probably will never be. PS: The reason I’m going nuts on this issue is that I’m writing a new one-person play called HUBBERT’S SLOPE. It’s inspired by the stories of some of the former oil company geologists and engineers who’ve ‘gone rogue’ on their industry and announced that the game is over. Contact me and I’ll show you a draft of it.